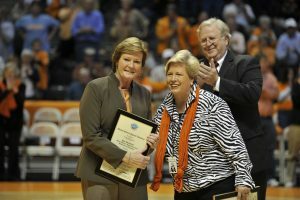 Former University of Tennessee head women’s basketball coach Pat Summitt, left, received the Academy’s 2011 Mildred “Babe” Didrickson Zaharias Courage Award, while Joan Cronan, center, received the 2011 Carl Maddox Sports Management Award. Presenting the awards during the 2011 season-opening game for the Lady Vols was Academy trustee emeritus Gene Policinski, right. 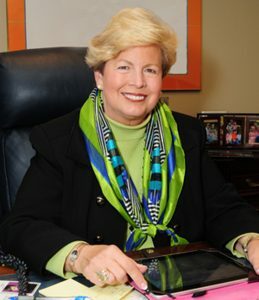 United States Sports Academy trustee Joan Cronan, the former women’s athletics director at the University of Tennessee, has been named the first recipient of the NCAA President’s Pat Summit Award. Cronan, who was named to the Academy’s Board of Trustees in 2014, was the Tennessee women’s athletic director from 1983 until 2012. She is credited with leading the school’s women’s athletic teams through their most successful stretch in which Tennessee won 10 national championships and 29 Southeastern Conference (SEC) championships. Under her leadership, Tennessee expanded women’s varsity sports from seven to 11 and annual giving to support women’s athletics increased to $2 million per year. During Cronan’s tenure, female student-athletes earned an average 93 percent Graduation Success Rate. She also stressed community service as part of an athletics experience at the university. She now serves as the women’s athletics director emeritus at Tennessee. Summit, who passed away in June 2016 after battling Alzheimer’s disease, received an Honorary Doctorate from the Academy in 2008. She also received the Academy’s 2011 Mildred “Babe” Didrikson Zaharias Courage Award. “Pat Summitt’s interest was always the student part of the student-athlete first,” Cronan said. “She felt that her basketball court was a classroom, and she was a wonderful teacher. It’s wonderful that the NCAA will honor her not just for her coaching but for her making a difference, and that’s why I’m so honored to receive this award. Summitt was the University of Tennessee women’s basketball head coach from 1974 to 2012. She amassed 1,098 wins — the most in NCAA men’s or women’s basketball history — eight NCAA championships and 32 Southeastern Conference titles. A five-time Naismith Coach of the Year, she also served as an associate athletics director at Tennessee and a member of the board of directors for the Women’s Basketball Hall of Fame. Among other roles, Cronan was named the interim vice chancellor and athletic director in 2011, making her the first in the state’s history to hold this title, which helped her earn the Academy’s Carl Maddox Sports Management Award that year. Cronan’s major role in this position was to administer the consolidation of the men’s and women’s athletic departments. She was the first female in the SEC to manage a full athletics department. Cronan is the former president of both the National Association of Collegiate Directors of Athletics and also the National Association of Collegiate Women Athletics Administrators, an organization which named her the 2005 Athletic Director of the Year. She has also served many roles within the National Collegiate Athletic Association Organization, such as a member of the Division I Leadership Council, Management Council, Executive Committee and the Championship Cabinet. Cronan was inducted into the Tennessee Sports Hall of Fame in 2008 and the Knoxville Sports Hall of Fame in 1998. She was honored in the Louisiana State University’s Alumni Hall of Distinction in 1995 and the College of Charleston Hall of Fame in 1990. Cronan, a graduate of Louisiana State University, earned her bachelor’s in 1966 and her master’s in 1968, both in physical education. After graduation, Cronan became the women’s head basketball coach and a professor of physical education at the University of Tennessee in 1968. She held these titles until she left to become the Director of Women’s Athletics at the College of Charleston, where she remained for 10 years before returning to the University of Tennessee in 1983.